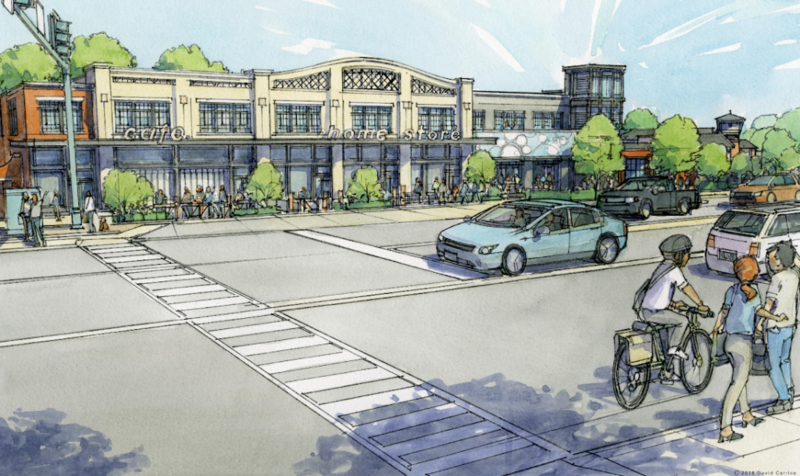 Following a solicitation and evaluation process, the City Council selected Neighborhood Development Company (NDC) to redevelop the Takoma Junction City-owned parking lot. The Development Agreement (2016) establishes the framework for the project. On July 25, 2018, the City Council endorsed NDC’s Draft Combined Plan, adopting Resolution 2018-41 authorizing the firm to proceed to the next phase of the development process. The City’s goals are for the project to act as a stimulus to the commercial district and locally-owned, independent businesses; improve the aesthetic appeal of the district; and be contextually sensitive and environmentally sustainable. The Montgomery County Development Review Committee (DRC) met with Neighborhood Development Company (NDC) representatives to discuss County and other agency staff comments on the proposed site plan and preliminary plan for the Takoma Junction development project. The meeting allowed NDC to follow up on DRC staff comments and technical clarifications. The County’s Department of Transportation and the Maryland State Highway Administration (SHA) stated that review of the transportation elements of the project will be delayed until after the SHA’s Vision project of the Junction intersection is completed this fall, thus delaying the project and the consideration of the project by the Planning Board. NDC will follow up with SHA about this. Questions remain about the position of the Historic Preservation Commission regarding the plans. The staff person for the HPC provided written comments that seemed to conflict with Master Plan provisions and traditional historic preservation principles. Few existing commercial properties in the Takoma Park Historic District would meet the criteria identified by the staff person, so clarification is needed. NDC has been meeting with the HPC staff person and then will be meeting with the Commission to learn the position of the Commission concerning the proposal. NDC will present a project update at the Takoma Park City Council meeting on Wednesday, March 20. The application and the documents have been posted on the Development Activity Information Center for Application # 120190150 and #820190090. NDC has submitted a corrected letter to the City Council providing updated information on the status of their project. Because efforts to obtain transferrable development rights (TDRs) to allow for the originally-proposed size of the building did not materialize, NDC is now proposing a building with a smaller footprint. This smaller plan maintains the important front building line but removes square footage from the rear of the building. At this time, the combined preliminary plan/site plan is being reviewed by the staff of the member agencies and departments of the Development Review Committee (DRC). The DRC is scheduled to discuss the plan at its March 19th meeting. The comments/questions that arise from this meeting will provide important information to the City Council as it considers the revised plan. Takoma Park staff will be reviewing the plan and how it complies with best practices and applicable laws in planning, stormwater, and tree protection. Staff will share these comments at the DRC meeting. When the plan comes back before the City Council, these and other DRC comments will be considered by the Council, along with a review of the plan in light of past City Council resolutions on the project and the Development Agreement. The City Council is likely to get a presentation on the plan and the initial comments from the DRC meeting in late March. The City Council will then consider a resolution on the modified plan after the final DRC report is prepared but before the Montgomery County Planning Board considers the application. It is not yet known when the application will come before the Planning Board. NDC submitted plans for the Montgomery County Development Review. On February 14, 2019, the County accepted the application and the documents have been posted on the Development Activity Information Center on their website for Application # 120190150 and #820190090. The submission by Neighborhood Development Company (NDC) of the plans for the Takoma Junction project is nearly complete and will likely become public in early February. As part of the expected back-and-forth between NDC and the Montgomery County plan reviewers, additional detailed plan information has been requested and provided. Because the submission does not include the sources of planned transferable development rights (TDRs) to allow the building to be the size proposed in the plans, the County requested information on how the building would be designed if transferable development rights (TDRs) were not able to be obtained. Part of the submission, therefore, is an additional plan showing a building of a smaller size, with the reduction in square footage taken from the rear of the building. Both the plan approved by the City Council and the smaller building design will be reviewed by the County Development Review Committee. The City Manager’s full statement. Council discussed and voted on a Resolution authorizing NDC to submit the Takoma Junction Site Plan to the Montgomery County Planning. Agenda; Video of Council Meeting; Resolution. Council passed a Resolution regarding the Neighborhood Development Concept Plan. Agenda; Video of Council Meeting; Resolution. Council passed a Resolution authorizing NDC to seek a Letter of Intent with a new anchor tenant for the Takoma Junction project. Agenda; Video of Council Meeting; Presentation Slides; Resolution. Council passed a Resolution granting a 30-day extension period for the Letter of Intent between NDC and the TPSS Co-op. Agenda; Video of Council Meeting; Resolution. Council passed a Resolution authorizing execution of the Development Agreement and a Resolution establishing the Community Consultation Process Advisory Committee. Agenda; Video of Council Meeting; Development Agreement. Council passed a resolution authorizing the initiation of negotiations with Neighborhood Development Company, LLC for the redevelopment of the City lot at the Takoma Junction. Resolution.